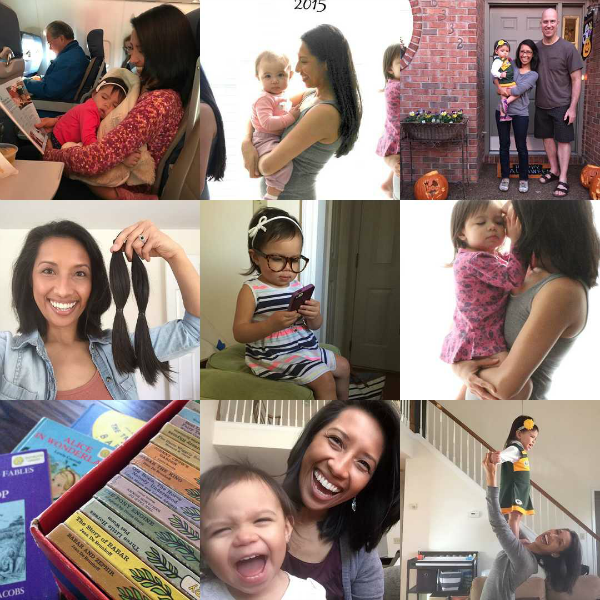 With a grand total of seven blog posts last year, it is a safe to say that 2016 was the year of my Instagram, which received much more of my attention. I love Instagram, because it reminds me of the very, very old days of Facebook back when your friends only posted photos of things happening in their lives -- long before it was the open forum of memes, viral videos, and a hot bed of political debate. (Ya feel me?) I continued to share on Instagram throughout the year, but it felt too daunting to type our stories. Unfortunately, it means that I never typed our stories. I'm committing myself to blogging and storytelling again in 2017. Even more than simply documenting stuff that we do, I want to record stories to pass down to Presley. More than the what. The how and the why. However, I wanted to give a quick nod to 2016 and the things it brought. Terrible rental management company didn't clean the house, and we were mad. MIL and S's nephew visited. Sign language really started paying off. First of my overnight business trips for me. Though I fought it since pregnancy, I learned that pink was/is Presley's favorite color during a trip to Target. (Humble thyself in the name of parenthood.) One of her most prized possessions is a pink tulle skirt that she chose. Think I'm kidding? Well, I'm not. Presley said her first word: Wow! Celebrated five years of marriage with pizza in a parked car with a sleeping baby and grinning glances at my honey through the rear view mirror. One of my best friends visited from Boston. Work was busy! Business trips every week. My first ever full nights and full days alone with Presley. Uplifted by two selfless friends (and their baby son!) who dropped everything to take care of Presley and me. Struggled to balance work, S's recovery, and school (but came through with an A-!) and decided to take a break from my MBA program until January. Sister met Presley, who took to her instantly. Visit from S's sister, her boyfriend, and niece. Turned one year closer to mid-30s. First time Presley played with a big kid. It melted our hearts. A girl named Leonora kind of took Presley under her wing during a birthday party at a local pizza place. Presley loved it! Officially sorted into Ravenclaw. <-- Yes, that is noteworthy. Spent half a day at Gentry's Farm here in Nashville to celebrate fall. Visit from MIL and BIL. Did a lot of cleaning at the new house. Halloween night was a blast! Did even more cleaning at the new house. Tried potty training on Thanksgiving weekend. It was a bust. We confused intelligence with readiness, and she was not having it. Visited family and friends in San Diego. Springing my first real surprise! Scored a free play kitchen for Presley, thanks to my frugal, internet-savvy self. Said farewell to my work mentor who had such a huge impact on my career and life. 2016, you brought a lot to the table. Some things are fine being left behind and many others we hope to see more of this year. Like the blog subtitle says: When you keep a pretty blog, because real life feels like a hot mess. Here's to doing things I love, getting back to community, and typing words that matter in this little space. Happy New Year! I AM SO HAPPY THAT YOU ARE BACK. Love you tons, Sis! Seeing you blog brings a smile to my face and joy to my heart! I hope that you do continue to blog throughout 2017. I'm definitely going to try to do it myself! Miss you big sis! I want a pink tulle skirt, please. I can't wait to read more blog posts from you this year!